Remember beautiful Ginger who came to OBG in June of last year after her owner became ill and could no longer care for her? Such a sweet girl who loves treats and wanted to be an only fur-kid. She was quite the hit at the holidays in her foster home! We were so excited when she found her forever home in February of this year. We received this note from her Mom and she is doing great. We just love a Happy Tail! I am so happy to have found OBG and our new lovely gal, Ginger. Ginger is the sweetest little girl ----and she has gradually fallen in love with us. It was tough after having several fosters, the last of whom she became quite attached to, and was sad to leave. So, our girl has let her guard down, and is quite the snuggler; loves being petted, LOVES baths and grooming...(not the hairdryer, though). She has staked out her favorite wingback... plays fetch with a tennis ball and I can now really see her smiling! Ginger's favorite activity is to take me for early squirrel hunts (aka morning walks). She stealthily sneaks things from the counter (what a clean kitchen I now possess --thanks, Ginger, for keeping us on our toes!) and she tolerates the mailman. She is full of the dickens and has a great personality. Someone is with her usually all day, and the rare occasions where she has to be left alone, she enjoys her crate. 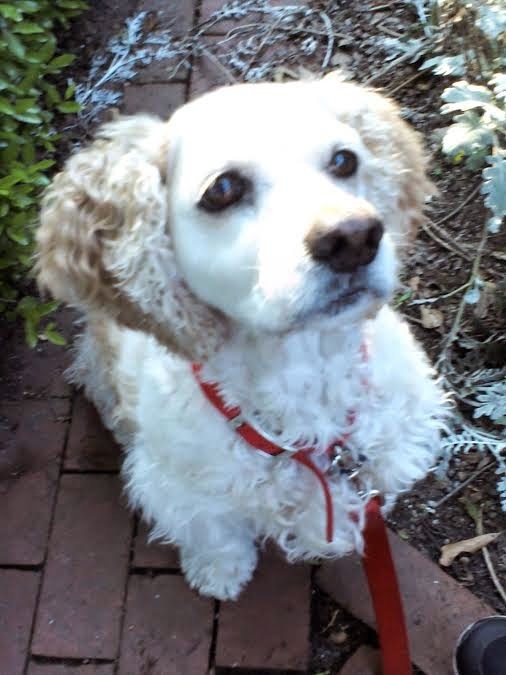 Ginger has made 3 trips out-of-state, and her earlier owners must have as well, because when she saw my suitcase in the foyer, she did a cute, cocker spaniel happy dance; Ginger always heads to the car to be let in for a ride. Our best, and we love what your organization does. We love this little girl with all of our hearts.